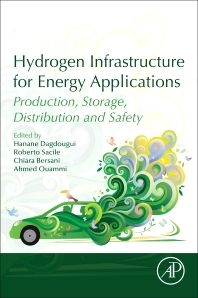 Hydrogen Infrastructure for Energy Applications: Production, Storage, Distribution and Safety examines methodologies, new models and innovative strategies for the optimization and optimal control of the hydrogen logistic chain, with particular focus on a network of integrated facilities, sources of production, storage systems, infrastructures and the delivery process to the end users through hydrogen refueling stations. The book discusses the main motivations and criteria behind the adoption of hydrogen as an energy carrier or future fuel alternative. It presents current research in hydrogen production processes, especially from renewable energy sources, as well as storage and distribution. The book also reviews methods to model hydrogen demand uncertainties and challenges for the design of the future hydrogen supply chain. The authors go on to explore the network planning of hydrogen infrastructures, the safety and risk issues in hydrogen logistics and their future expectations. Energy engineering professionals, researchers and graduate students will find this a helpful resource to understand the methodologies used to assess the feasibility for developing hydrogen supply chains, hydrogen infrastructure and safety practices. Energy analysts and government agents can benefit from the book's detailed discussion of hydrogen energy applicability. Hanane Dagdougui received a Ph.D. degree from the Faculty of Engineering of Genoa, Italy and the Mines Paris-Tech, Paris, France, as part of an international joint program in December 2011. She was a research assistant at the Faculty of Engineering in Genoa, and currently, she is Postdoctoral research Associate at the Department of Electrical Engineering at the ÉTS Montreal, Canada. Her main research interests are related to Smart Grids, in particular modelling and planning microgrids and control and optimization of microgrid and network of microgrids. Roberto Sacile received a Laurea degree in electronic engineering from the University of Genova, Italy, in 1990 and the Ph.D. degree from Milan Polytechnic, Italy, in 1994. He is with University of Genova since 2000. He has been visiting scientist at Université de Technologie Compiègne (UTC), France, in 2013 and 2014. His main research interests are related to decision support methodologies and optimal control techniques with specific applications to energy, environmental and transport systems. During the last ten years of research, the scientific and scholarly work of Roberto Sacile has been devoted to the modelling of human activities on territorial systems, with specific reference to decision support systems (DSS) coupled with optimization and control techniques in different domains all related to risk management, system sustainability and sustainable development. The concept at the basis of his research is that a DSS must support decision makers (DM) filling the gap between the complexity of data which can be acquired by a proper “sensor” field, and the practical decisions which should be taken at strategic, tactical and operational level. His work focuses on practical current problems of nowadays society, with applications widening in different domains under a common matrix of risk management, sustainable land use and development. His current research idea is that risk management and sustainable development requires the support of a system of systems modelling approach where the different multidisciplinary aspects of the problem interact among themselves and are supported by specific measurable indicators. Chiara Bersani, received her PhD at University of Genoa in "Service science applied to transport and logistics systems". Her PhD thesis was related to models and methods for the integrated management of multi-inventory systems and distribution processes with the implementation of a decision support system for a network planning of fuelling service stations in a near-term competitive scenario of the hydrogen economy. Her research interests are related to transport and logistics systems, with special reference to hazardous material management and inventory routing problems. She has been co-editor of the book on “Advanced Technologies and Methodologies for Risk Management in the Global Transport of Dangerous Goods”. Ahmed Ouammi received a Ph.D degree from the Faculty of Engineering, University of Genoa, Italy, in 2010. He was with the DIST Department, University of Genoa. Currently, he is an Assistant Professor at the National Center for Scientific and Technical Research, CNRST Rabat, Morocco. His research interests involve renewable energy and optimization of energy systems, with special reference to development of methods and models of decision support system. His research includes development of optimal control techniques with specific applications to microgrids and smart systems. His research has appeared on papers published in conference proceedings and journals.